Place milk, brown sugar, vanilla and cinnamon into a large mason jar. Put the lid on the jar and shake vigorously until you see bubbles (about 30 seconds). Take the lid off the jar and add in the chocolate chips. Place the jar into the microwave for 45 seconds. Take the jar out of the microwave and add the coffee. Place the lid on the jar again and shake vigorously for 10 seconds. 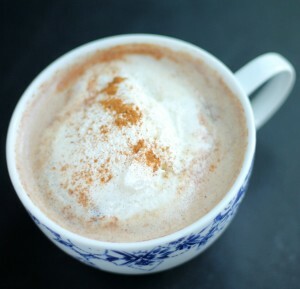 Add a dollop of whipped cream on top and sprinkle cinnamon.